Ethanol is a lot less expensive than Hydrogen. A fuel cell is a device that can obtain 40 to 50% efficiency in conversion of a fuel into useable power (as opposed to approximately 18% efficiency for the average internal combustion engine). This technology is a by-product of the NASA space program, developed to provide a lightweight and efficient power source for use on manned space missions. Some fuel cells use specialized molecular sieves made of complex polymers with some type of anode/cathode properties , and others use expensive platinum catalysts. There are four main types available. Some use pure hydrogen as a fuel source to make electricity. Some are designed to run on propane, but may only have a membrane life expectancy of 3,000 hours (125 days). One of the main problems with any fuel cell is contamination of the membrane. So it seems like a great advantage, then, to use a fuel source which has been distilled and is 99.9999 % pure. The ideal fuel for a fuel cell is ethanol. Plus, this is a biologically derived fuel with no horrible byproducts. 1. Fuel cells operate very efficiently compared with internal combustion engines, reducing the price gap between utilization of ethanol and cheap imported gasoline. 2. Hydrated ethanol (alcohol which still has some water content, not 200 proof) can be used in a fuel cell system with no loss in efficiency compared with 100 % high-grade ethanol, opening the way for the use of ethanol that can be used at a lower cost. In a program conducted in 1996 for the ICMB, Arthur D. Little conducted a series of tests to demonstrate the use of hydrated ethanol in an advanced fuel processor. The results of this testing were successful and have been presented at prominent industry gatherings, including the 1996 Fuel Cell Seminar and the 1996 DOE Customer Coordination Meeting. This research is also the subject of a paper entitled, "Evaluation of Hydrated Ethanol in an Advanced Fuel Processor," which has already been accepted for publication and will be presented at The Society of Automotive Engineers Annual Conference in March, 1997. This technical work and publication effort has kept ethanol positioned as a desirable fuel cell vehicle fuel. In the meanwhile, fuel cell vehicle advancements have occurred in other programs at a very rapid pace. The proposed program for 1997-2000 will continue to promote the use of ethanol in advanced fuel cell powerplants. Arthur D. Little will compete on a team for a $15 million, three-year, cost-shared DOE contract to develop a fuel cell powerplant capable of operating on multiple fuels. In Arthur D. Little's proposed program, ethanol has a visible and attractive role. The designs and tests conducted in this program will highlight ethanol's performance in a 50-kW fuel cell powerplant. By 2000, this powerplant--capable of operating on both ethanol and ethanol blends--will be ready for integration into a prototype light-duty vehicle or hybrid bus. This program thus positions ethanol as a premier fuel for transportation powerplants of the 21st century. This program will demonstrate that ethanol--even low-cost hydrated ethanol--can be used in advanced fuel cell vehicles. Fuel cell buses operating on other fuels are already on the road. Under the Partnership for a New Generation of Vehicles, each of the Big Three is working on fuel cell passenger cars. By 2008, a fleet of 3,000 fuel cell buses and 5,000 fuel cell cars could consume about 18 million gallons of ethanol yearly. Breakthrough research sponsored by the Illinois Corn Marketing Board and the State of Illinois has opened the way for efficient, zero-pollution fuel cell cars and buses powered by ethanol. Fuel cells are up to three times as efficient as conventional vehicles and emit virtually no pollutants. Renewable ethanol made from corn can power these fuel cell vehicles using an ethanol fuel processor developed by Arthur D. Little, Inc., of Cambridge, MA. Ethanol is the ideal fuel for advanced fuel cell vehicles since it reduces oil imports and has fewer negative consequences for the environment than any other practical fuel alternative. In 1996, several stunning achievements in fuel cell vehicle technology were announced by major automakers. In May, Daimler-Benz unveiled its NeCar II, a second generation fuel cell powered van with a 200-mile range and five-passenger capacity. In October, Toyota showed a fuel cell vehicle based on the highly popular RAV4, a sport utility vehicle. Both companies have announced satisfaction with the progress of fuel cell technology, and both have publicly stated their intent to proceed toward a production decision for fuel cell vehicles. These vehicles are shown in Figure 1. Automotive News, the most authoritative (and technologically conservative) source in the industry, covered these developments with front page stories. Discussion in the automotive industry has turned from debate over the practicality of fuel cell vehicles toward a discussion of possible timetables for their introduction. While the practicability of fuel cell technology has been demonstrated, the issue of which fuel these vehicles will operate on is still very much in flux. Fuel cells ultimately need hydrogen to operate. The Daimler and Toyota vehicles operate directly on hydrogen, which is an impractical transportation fuel for the near term. Daimler, Toyota, General Motors, and Georgetown University all have major programs underway to develop fuel cell powerplants that utilize methanol. The American Methanol Institute is a vocal advocate of methanol as a future fuel. Methanol is not a logical or appropriate fuel since no production or delivery infrastructure currently exists, and its use will not reduce dependence on foreign energy resources. In addition, methanol fuel cell vehicles cannot utilize ethanol. Over the last several years, Arthur D. Little, with support from the Illinois Corn Marketing Board, the State of Illinois, and the Department of Energy, has worked to keep ethanol positioned as a viable fuel for fuel cell vehicles. In 1994/1995, this involved critical technology demonstrations and design developments that proved that ethanol can be effectively transformed into hydrogen on board a fuel cell vehicle. Figure 2 shows the resulting 50 kW multi-fuel reformer on its test stand. This fuel processor is more advanced and compact than any methanol fuel processor shown to date. Chrysler, General Motors, and Scania have shown keen interest in this design, and it will appear on a static show car in an upcoming North American auto show as a statement of one automaker's intent to build prototype fuel cell vehicles using the ADL reformer technology. The successful development by Arthur D. Little of a multi-fuel reformer has significantly altered the discussion of fuel choice for fuel cell vehicles. Because it was designed to process ethanol denatured with gasoline, the multi-fuel reformer is also capable of processing straight gasoline. GM and Chrysler, supported by several oil companies, now advocate gasoline fuel cell vehicles as the best interim solution to more efficient, lower polluting vehicles. For ethanol interests, this is a mixed blessing. U.S. industry has become a strong advocate of this technology, resulting in greatly increased private and DOE resources directed toward the development of multi-fuel capable fuel cell powerplants. The bulk of DOE's fuel cell vehicle budget over the next three years (over $30 million) will be directed toward multi-fuel fuel cell powerplant development. Commercialization of fuel cell vehicle technology can also occur much more rapidly using a widely available fuel such as gasoline since a national fuel infrastructure already exists. However, neither the auto companies nor the oil companies can be expected to highlight this basic fact: Any fuel processor capable of using gasoline can also be designed to utilize ethanol. Many technical aspects of ethanol fuel processing (such as carbon formation and sulfur trapping) are simpler with ethanol than with gasoline. In 1996, Arthur D. Little continued to refine the multi-fuel fuel processor, working with major automotive companies to integrate this technology into advanced vehicle designs. Arthur D. Little (with support by the Illinois Corn Marketing Board) continued to advance the case for ethanol, a very desirable fuel for fuel cell vehicles. Our technical work program for 1996 was aimed at improving the cost associated with use of ethanol as a fuel cell fuel. We successfully operated our fuel processor on hydrated ethanol, demonstrating that a lower cost feedstock can be used. The successful results of this program have been presented in various public forums including the 1996 Fuel Cell Seminar. Appendix A includes a draft of a technical paper describing the results of our 1996 program to be presented to the Society of Automotive Engineers in March, 1997. Form a competitive team (including Arthur D. Little, the Illinois Corn Marketing Board, other ethanol interests, a fuel cell developer, and other commercial companies) to successfully compete for a DOE contract for fuel cell powerplant development. Each participating organization, including Arthur D. Little, will be responsible for its own proposal preparation costs. No Illinois Corn Marketing Board funding is requested to achieve this objective. Include design tasks in the proposed DOE work program to ensure that the powerplant that is developed is fully compatible with ethanol, ethanol blends, and hydrated ethanol. Include explicit demonstration tasks in the proposed DOE work program to effectively demonstrate ethanol operability in the fuel cell powerplant. Continue to underscore the positive role of ethanol in fuel cell vehicles in prestigious and visible technology and policy forums. Specific tasks for the DOE fuel cell powerplant program will not be determined until DOE publishes a full RFP in mid-December, 1996. The full proposal will be submitted to DOE in early 1997. A copy of the completed Technical and Cost Proposals will be provided to the ICMB on request. As we develop the complete DOE Program Plan, we will include tasks consistent with the objectives described above. The dissemination of results, is a vital step in maintaining ethanol's position as a premier alternative fuel. As shown in Table 1, there are a variety of stakeholders with different influences on the use of ethanol in transportation. Ethanol is a fuel with future vision. Ethanol used in fuel cells is superior to methanol and hydrogen on an economic and technical basis. 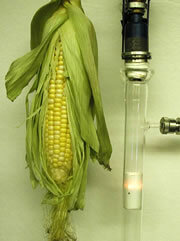 Ethanol can be used economically in advanced vehicles. Continued investments in ethanol vehicle technology are desirable. Ethanol is the preferred fuel for fuel cell powerplants. There are a wide variety of forums which are appropriate to disseminating the results of this work. These forums can be selected to influence all of the stakeholders listed above. Example forums are shown above. Written papers submitted for technical meetings such as SAE and Fuel Cell Seminars can also be distributed for further impact. Arthur D. Little's interest in dissemination of results runs parallel to the Illinois Corn Marketing Board's wishes to be seen as the premier developer of advanced fuel cell technologies. Therefore, our commitment to discussion of this promising development is quite strong. This effort is supportive of our ongoing fuel cell power system business development efforts. Therefore, much of the anticipated cost of dissemination of results will be borne by Arthur D. Little. Our costs shown are primarily for document preparation and production. Costs for attendance at conferences and meetings will be primarily borne by Arthur D. Little. The requested financial commitment over the course of the program will make the Arthur D. Little team more competitive, increasing our chances of successfully obtaining one of the two anticipated contract awards for fuel powerplant development. These are 25% minimum cost-share contracts and Arthur D. Little and other team members will be making cost-sharing commitments as well. The participation of the Illinois Corn Marketing Board will reinforce the interest of the ethanol community in this program. While DOE has, for the moment, bowed to marketplace reality in adopting a gasoline-based technology strategy for initial fuel cell vehicle introduction, the use of ethanol is far more consistent with the DOE core mission. By including ethanol-specific design and demonstration tasks, the role of ethanol as a highly desirable fuel cell fuel will be highlighted and preserved. As in the past, Arthur D. Little is committed to conducting a public and vocal discussion in technology and policy forums of the merits of the use of ethanol in advanced vehicles. The proposed technology demonstration will position ethanol as the preferred fuel for advanced fuel cell transportation systems. This long-term vision provides strong incentive for the expansion of current ethanol IC engine applications. In the near-term, ethanol powered fuel cell transit buses will consume significant quantities of ethanol and provide continued momentum. In the medium-term, fuel cell light-duty vehicles powered by ethanol will provide an extremely robust market. A very feasible market development scenario is illustrated in Table 2. The above figures do not account for the strong "halo" effect that the vision of advanced ethanol applications can bring to efforts to expand ethanol IC engine applications. The DOE fuel cell powerplant program will begin in 1997. The budget in Table 3 reflects the requested cost-share participation for the Illinois Corn Marketing Board over the three-year life of the DOE program. The greater requested allocation of funds in later years of this program reflects the anticipated spending rate for the entire program and is predicated on success in earlier years of the program. As discussed in Section C, the second and third years involve increased rates of expenditure consistent with testing of a full-scale ethanol fuel cell powerplant hardware. ADL will team with a leading fuel cell developer and other commercial firms to compete for the pending DOE fuel cell powerplant procurement. The Illinois Corn Marketing Board and possibly other ethanol interests will be shown as co-sponsors of the proposed program. No ICMB funding is being sought for the preparation of the DOE proposal. Build your own laboratory quality still with an automatic temperature control valve, with an output of 20 liters/hour of 190 proof ethanol.